Engine Mount Bolt Size? - Turbo Dodge Forums : Turbo Dodge Forum for Turbo Mopars, Shelbys, Dodge Daytona, Dodge SRT-4, Chrysler PT Cruiser, Omni and more! Turbo Dodge Forums : Turbo Dodge Forum for Turbo Mopars, Shelbys, Dodge Daytona, Dodge SRT-4, Chrysler PT Cruiser, Omni and more! > Turbo Dodge Technical Chat > Engine - General, Exhaust & Induction > Engine Mount Bolt Size? Anyone know the specs / size of the bolt that goes through the center of the front engine mount insulator? This is for a 1986 Chrysler New Yorker with the 2.5 TBI. The Part Number for this appears to be 4271 953 [SCREW and WASHER]. Someone did a hack job on this car and put a much larger bolt in-place and reamed out the bracket... which of course won't fit into a new engine mount insert. 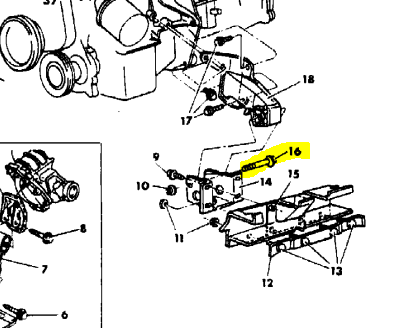 Re: Engine Mount Bolt Size?